The Story of Sushi author Trevor Corson schools us to the facts about this beloved—but misunderstood—Japanese speciality. Sushi has gone through a fascinating evolution in this country, from exotic high-end import to ubiquitous staple. Along the way, the audience has become more polarized than ever: Snobs won’t go near the stuff unless it comes from the most hallowed temples of sushi-master zendom, while the downmarket version—sold in plastic containers at supermarkets—is now basically a faddish health food, as pedestrian as wraps and smoothies. But what do we really know about sushi? Despite its popularity, the Japanese delicacy remains one of the most misunderstood cuisines in the U.S.—a minefield of misinformation littered with improperly labeled fish and supersize “Kamikaze” rolls. From assumptions about what sushi is most “authentic” to the way we slather our nigiri with wasabi and soy sauce, most of us have the raw fish game all wrong. To sort out the facts from the myths, we tracked down an pro who could set us on the path to sushi wisdom. Trevor Corson, the author of The Story of Sushi: An Unlikely Saga of Raw Fish and Rice, traveled to Japan for the first time when he was 16 on scholarship for a summer home-stay program. When he tried sushi in 1986 Washington, D.C. in preparation for his trip, he remembers thinking, “Now here’s a cuisine that is truly repulsive and I never want to eat this again.” After trying sushi at a neighborhood restaurant in Japan with his host family, he changed his tune and realized he had a lot to learn—and a lot of new fish to try. Since his humble discovery as a teen, Corson spent three years living in Japan, worked as a commercial fisherman, and penned the pop-science bestseller The Secret Life of Lobsters: How Fishermen and Scientists Are Unraveling the Mysteries of Our Favorite Crustacean. He also regularly hosts educational “historical sushi dinners” in New York City (for more info visit his website). Through his own travels and his commitment to studying sushi in both its traditional and modern iterations, Corson is helping to educate others on how to better understand and enjoy sushi. With that, it’s time to put down the sake, leave the chopsticks on the table, and do this thing right. Here, Corson debunks 15 common sushi myths that tend to circulate among diners in the U.S.—his answers will help you navigate your next sushi dinner like a true aficionado. Corson says: First of all, straight-up soy sauce is really too strong for most of the fish and the flavors of traditional sushi. A good chef dilutes the soy sauce into a house brew that is called nikiri. Each good chef usually has their own secret recipe for this, and it is a mix of broth, maybe some sake, and some other ingredients all simmered together. This softens the soy sauce a lot and makes it a better match for the fish. With that said, if you have a good sushi chef, then you shouldn’t even have to use that either. When I eat sushi, I never have a dish of soy sauce beside me at all unless I am eating sashimi. With sushi, a good chef should be pre-seasoning every piece of fish for you. He should have a little brush that he is using to wipe a little sheen of his nikiri sauce on each piece before he gives it to you. Corson says: Traditionally, pairing sushi and sake was a big no no. The classical mentality of Japanese cuisine was that you would never mix a drink made of rice with a food made of rice, becuase there wasn’t enough contrast between the flavors. That’s why a traditional sushi meal often begins with kaiseki-style dishes—traditional small plates of appetizers and salads—put out by a chef specifically so that you could sip some sake. When a person would switch to eating sushi, they would also switch to maybe beer or green tea. It is not low-class to have beer with sushi. All that being said, nowadays, sakes have become much more widely available, and many are very good. There are some very interesting pairings to be had, but for my money, sake still goes best with non-sushi, traditional Japanese food. Corson says: In doing the research for my book, I was pretty interested to read that the sushi connoisseurs in Japan consider bluefin toro—or any fatty belly cuts—kind of boring and simplistic because of their melt-in-your-mouth sensation. Yes, there are some pretty intense flavors there, but it is not a particularly sophisticated experience or mouth feel for sushi. Sushi aficionados tend to be much more interested in more traditional, smaller fish like mackerels, other flounders, and shellfish—things that have more subtle flavors and much more interesting, resilient textures. The bluefin tuna was basically invented by Japanese airline cargo executives who were trying to find a product they could put in their planes on return flights from the U.S. to Japan, and there were a lot of bluefin tuna at the time. So they essentially created a market for it. Tuna used to be considered a garbage fish for sushi, especially the belly cuts. There are stories that fishmongers would cut those pieces off and feed them to the cats. Corson says: If you have a good sushi chef, he is practicing the art of serving each fish at the moment when it has aged to the point where it is most flavorful, but also a time before the texture has started to degrade. That can be any day of the week. People assume that you want your sushi fish as fresh as possible; however, that is not the case. A lot of fish taste better after they’ve aged a day or two. Chefs are keeping track of their inventory, and much more important than the day you go is knowing the chef and being a valued customer. Regulars are the people who are going to get the fish that is best eaten on a certain day. The customers who don’t know the difference are the ones who are going to get the fish that are a little bit past their prime. No good sushi chef ever serves fish past its prime, but I also say that in jest because if you have ever ordered a roll that has anything deep fried, the thing that is deep fried is probably a fish that is passed its prime [in terms of when it would be served raw in sushi]. Of course, if it’s fried, it’s not going to hurt you, but maybe you aren’t there to get the ultimate fresh fish. You probably aren't if you are ordering a fried roll in the first place. Corson says: Over and over again, sushi chefs have told me that if they see people adding extra wasabi to their sushi or to their soy sauce, they immediately stop giving them their best fish because they know they won’t be able to taste the difference. Chefs put just the right amount of wasabi into the fish when they make it at the sushi bar. Often, at a good sushi bar, they are calibrating the amount to a particular fish, depending on its richness. You are messing up that calibration if you add more. If you put wasabi in soy sauce you are lessening the spiciness as well, because you are reducing it in liquid. The one exception to this is when you are having sashimi—which is just pieces of fish without rice—you should get a little extra wasabi that you can dab on to a piece of fish, then dip it into the soy sauce, and then put it into your mouth. That way the soy sauce and the wasabi don’t mix until they are in your mouth. Corson says: I would say that if you are going for really old-fashioned, simple sushi, it can be healthy. But on the whole, most of the sushi we are eating [in the U.S.] has a lot of carbs and the fish that you are getting in average sushi bars is of very questionable origin. Most of the salmon that people are eating in [these restaurants] has been farmed in large industrial operations where there are known issues with toxins such as PCBs, antibiotics, and pollution. The same goes for eel, or unagi, most of which is taken from polluted mass farms and unregulated places like China. Also, a lot of the sushi that we tend to like [in this country] has a lot of mayonnaise and fatty sauces. Corson says: One of the great things about the cuisine is the visual beauty of it, especially when you are getting a traditional meal from a master chef. Looks can be deceiving, however, as there is a whole practice in the industry of gassing tuna with carbon monoxide to make it look pink. The pinkness is by no means an indication of freshness. That being said, if the tuna looks like it is turning brown around the edges, I might opt for the vegetable roll. Corson says: It is very, very sad that patriarchy is alive and well in the traditional sushi world, especially in Japan. There is still a lot of discrimination against female sushi chefs. There are all these myths about women and sushi-making that don’t hold any water. You often hear in Japan that women’s hand are too hot because they are too emotional, and so they cook the fish while they handle it. That is absurd and scientifically inaccurate. There was even a study done in the medical journal The Lancet showing that men’s hands tend to be warmer than women’s hands. There are other arguments given too, all of which are specious. I have worked with some wonderful female sushi chefs who have made great sushi for me and my guests. Some Japanese women who want to be sushi chefs have to come to places like New York; it’s just too much trouble to do it in Japan because the discrimination is still too strong. Corson says: We think sushi originated in Southeast Asia, around what is now known as Northern Thailand. It was a method for preserving river fish by packing them in rice. This technique of fish preservation spread to other parts of Asia, and eventually came to Japan, where it was adapted. You can still get that traditional form of sushi in Southeast Asia, in Taiwan, and in a few shops in Kyoto—the old capital of Japan. It is called funazushi, and it is a fermented fish and rice concoction that is a little bit like cheese. Corson says: Actually, in a traditional high-end sushi bar meal—there are different schools of thought on this, but in general—eating with your fingers is a good idea. This allows the chef to pack the pieces of sushi together more loosely. If you are especially skilled with chopsticks, as many Japanese connoisseurs are, then the chef can make the sushi loose and you can still pick it up. But most of us, especially in the U.S., are not that great with chopsticks. When we eat with chopsticks and chefs see this, they will pack the sushi together much too tightly so that they won’t fall apart when we try to pick up the sushi. Most people have never eaten a piece of nigiri the way it was supposed to be made because everything is all mashed together too tightly. Using your hands and letting the chef season the sushi (i.e., not dipping it in soy sauce) allows for an incredible experience where the rice falls apart and sort of mixes with the fish in your mouth. Corson says: Sushi was very much a mystery food for many Japanese people, especially in the days when it was more of a high-end meal that only businessmen who would go out for. It was often male-dominated, as women weren’t really welcome at traditional sushi bars—it was kind of a boys' club thing. Many Japanese people would have been just as uncomfortable in a sushi bar in Tokyo as an American might. That did start to change with the invention of conveyer-belt sushi. These were low-end sushi chains that sprung up around Japan over the past few decades. These places popularized cheap sushi in Japan, but high-end sushi—which people eat more frequently than they used to—is by no means a daily meal. Most Japanese people probably eat their version of curry rice [kare raisu] more often than they eat sushi. Corson says: It is real sushi. The word sushi refers simply to short-grain rice that has been seasoned in a certain way with vinegar and, nowadays, a little sugar and a little salt. So in Japan, anything that is made with rice and seasoned that way—no matter what shape or size (there are many many regional styles of sushi)—is called sushi. So that makes a California roll 100%, authentic sushi. Corson says: Again, if the nigiri is made loosely, it will all fall apart and mix together in your mouth anyway. The other thing is that a good chef will be seasoning the sushi before he gives it to you—a little sheen of sauce or something on top—as well as adding little garnishes on top of each nigiri to match that fish. The garnishes can vary greatly, from grated ginger to a little bit of some other topping on the top of the fish. If you are turning the nigiri upside down, then the garnish might fall off. Corson says: Ginger is meant to be a palate cleanser, like a sorbet between courses in Western cuisine. It is designed to have a bite of between different pieces of fish to cleanse the palate and prepare the tongue for the flavors of the next fish that the chef is going to serve. 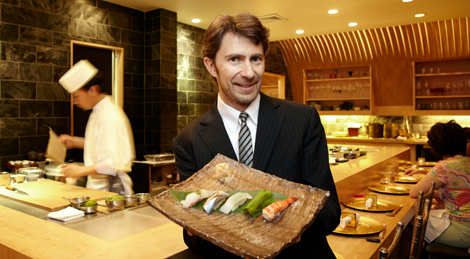 Corson says: Honestly, the quality between a grocery store and the average sushi restaurant [in America] is not that much better or different. I think that the awareness about treatment of raw fish is pretty well-spread, so I am not worried about how the supermarket is handling the fish or anything like that. That said, all the other [concerns] about whether it is healthy and where the fish is from still apply.